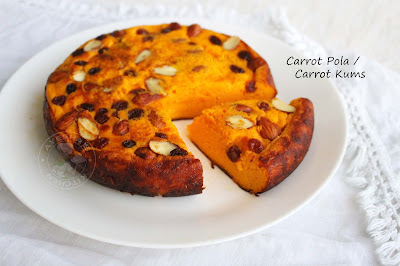 Carrot pola is a very popular Malabar special sweet which resembles like a cake and so it also named as carrot egg cake made on stove top. I just love to make pola every time as it is a very quick one pot meal. No mess yet a yummy kids friendly recipe. You can make Apple pola, Dates pola, Bread pola following the same recipe. This sweet is a common Ramadan / Iftar dish which is prepared with carrot and eggs. The cooked carrot, egg, milk powder, sugar, condensed milk are pureed together in a blender and then poured into a sauce pan, garnished with nuts and cooked over a low flame until it is set. As eggs and carrots are good for kids, this carrot egg cake will be a good sweet treat for toddlers and kids. For me, I love to have this for brunch. A lovely yummy treat. 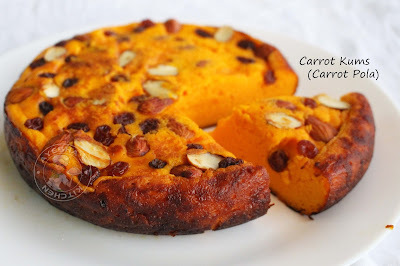 Here is the recipe showing how to make carrot Pola / flourless cake recipe /carrot dessert recipes/carrot dessert recipes /easy carrot recipes/carrot kums / toddlers recipes. In this video I have used raw carrot instead of boiled carrot. Boil some water (1 small cup) and add the roughly chopped carrots to it. Cover it and cook well. When done, drain the water and transfer the cooked carrot to a blender. (This is optional only, most people used to grind the uncooked carrot along with the other ingredients). To this, add eggs, milk powder, sugar, condensed milk, cardamom powder (optional) and blend them well. Mix it with a spoon. (you can also add maida / all purpose flour mixed with some water and make a paste. Add this along with these ingredients. This helps the pola to set fast). Now heat a non-stick round pan with ghee. Fry nuts (i used almonds only) and raisins. When done, transfer it to a plate. Then pour the prepared carrot mixture into the pan with the leftover ghee. Cover it and cook for 5 minutes in a low flame. Now open the lid and spread the fried nuts and raisins. Again cover and cook over a low flame for 20 - 25 minutes. Check occasionally. When the top of the carrot pola is done, flip it into a greased pan carefully. You will not get a perfect slice once it is hot. Tasty, healthy carrot pudding/carrot pola / carrot kums ready. Toddlers will love this for sure. Do try this healthy toddlers sweet recipe.